Five years ago, I probably would sooner have had my head held underwater in a toilet bowl than drive a Volvo. This probably wasn't a fair bias, but they just looked so unappealing and seemed to embody "uncool" like no other car out there. At $2 a gallon for gas, its terrible mileage started bankrupting me. Its cargo space was poorly engineered - the seats didn't fold down all the way and the space in the rear was not very usable. The rear cargo area is superbly engineered. Both the back seats fold down flat making a totally usable flat space all the way up to the front seats. The car maneuvers and parks really well, especially with the ultrasonic sensors when backing up. The car's exterior looks pretty good; its actually remarkably similar to the BMW SUV. The car handles pretty well, particularly with the AWD (all-wheel drive) and is a hell of lot better at cornering than the large SUV's. The car does have a couple of flaws. The biggest one is the engine. Both the 5 and the 6 cylinder options are fairly weak. I ended up buying the smaller engine, because it was cheaper and the larger engine wasn't noticeably more powerful. The pickup in the car is pretty mediocre, though I would not call it dangerous - there is enough power to get on the freeway without getting smushed. However, it is disappointing that this small and under-powered engine is simultaneously weak on gas mileage. I am getting about 16-17 mpg with the car, which is certainly better than my Navigator, but low given how much smaller the car is and how small the engine is. I would have hoped it got at least 20. This would probably be the perfect car if Honda or Toyota would make an engine for it (By the way, I heard on the radio the other day that Volvo is adding a V-8 option). Congrats on your new Volvo XC90. I do hope you bought the extended warranty. If you did not, please do so, now. My 2000 Volvo Cross Country V70 started having major problems right after it came out from under its 4-year warranty but with only 35,000 miles on it. I got rid of it and got a Honda pilot (5 star crash test rated, too) which is now getting closer to 18 miles a gallon. Anyway, I got rid of the Volvo because without the extended warranty (dumb move on my part) I could not afford $1,000 plus repairs. (I had two in a row!!) When it had to be towed for the third time in as many months I said that was enough. Good luck -- The XC90 truly is a beautiful vehicle -- I hope you continue to enjoy it. Oh, the milage may pick up a little in the months ahead. Yes, I did buy the extended warranty. My wife owned a Volvo once and I took from that experience the same lesson you did. However, so far, so good. Hey, congrats on getting the XC90 anyway. ItÂ´s a real pity diesel engines havenÂ´t caught on in CONUS, yet. IÂ´ve driven and ordered the diesel powered XC90 D5 AWD (in Europe, there is no FWD variant, with the new 185hp/400nm engine. The old Diesel had only 163 hp, but was quite nimble considering the bulk of car it has to haul, and the new engine will be even better. The mileage is awesome, IÂ´ve seen numbers as low as 10 liters per 100 km (sorry, youÂ´ll have to convert that), top speed with the old engine was 185 kph, new engine 195 kph. I can't believe it, my co-worker just bought a car for $11673. Isn't that crazy! Congrats on the new car. I bought my 2005 XC90 a year ago and have started to enjoy driving for the first time in my life. I too opted for the smaller engine. Primarily for reliability and mileage. I am a bit confused though, many people say the engine is weak and has poor acceleration. My experience is the exact opposite. Usually, I'm quite ahead of everyone else on the freeway onramp, unless there's a Corvette or Porsche next to me. Regardless, it's an amazing car and I highly recommend it. My mileage averages 17 street and 25 fwy. My wife loves her XC90 V8. The V8 engine built by Yamaha for Volvo has got some real power and has a great growl to it. So far after 6 months and 12,000 miles it has been perfect! 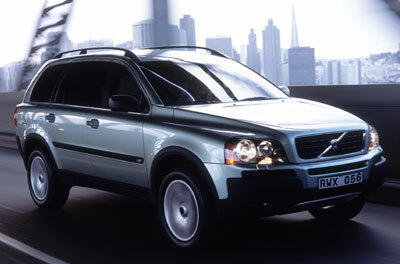 The XC90 has lot more personality than almost all the Japanese competition and is much more attractive. I hope they come out with a smaller version which would appeal to my adult children.As far as extended warranties go I equate them to having health insurance. If you are going to keep a vehicle beyond the warranty the extensions will always pay for themselves. Ever wonder why so many of the extended warranty companies go out of business? They pay way too many claims! I think you picked a winner as well. We bought an XC90 in 2003 and think it a perfect family SUV. A NOTE OF CAUTION -- our XC90 has developed serious safety problems. In our case, the AWD system malfunctions without any warnings to the driver and causes the vehicle to drive very erratically. The problem was confirmed by a dealer six month ago, but neither they nor Volvo can fix it. Turns out my XC90 doesn't report any diagnostic codes for the AWD failures. The dealer and Volco have replaced lots of items, including the AWD transmission, but my XC90 is still broken. The Volvo regional manager for my area says all he's willing to do is keep trying to fix it. He doesn't seem to care that I'm driving an unsafe example of what's supposed to be the safest SUV in the world. MAKE SURE YOU REPORT A SUSPECTED AWD PROBLEM DURING YOUR NEXT SERVICE CALL, or you may be stuck with your XC90 if it develops this problem after it's out of warranty -- just as I am now. My proposed Volvo tagline -- Safest cars in the world. Unless the one we built you has safety problems we can't fix. Then you are on your own. Had a XC90 for six months in UK. Agree with most of above - diesel engine (165 hp) a bit weak, tyres wearing prematurely, but otherwise OK. Will seriously consider Grand Cherokee next time. I had volvo V70 for 1 year and it works excellent. It never broke down. I didn't have to change nothing in it even though i made 120 987 miles on it. The car is very powerful it can go 146mph with the engine 2.4 Se Auto (170Bhp). The next car i will buy is a volvo s 80 the safest car in the world. VOLVO is the best. Have had an XC90 2.5T here in Australia for 2 years. Excellent family car and to my surprise very capable off-road. Only complain is fuel consumption but Diesel model just released here. I love the touring ability and comfort and exceptional interior design. Well done Volvo, I'll be coming back for more.